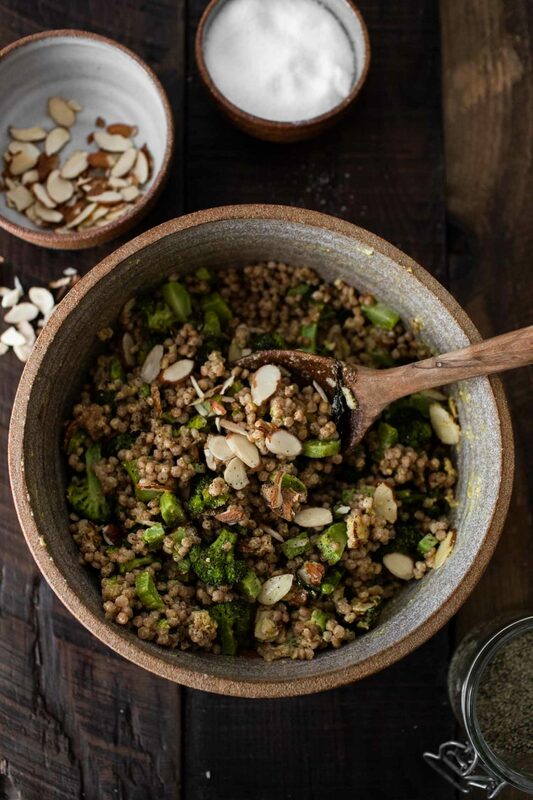 Broccoli Salad with Couscous and Tahini Dressing | Naturally. For these types of salads, I would typically use cauliflower. However, I wanted to keep the color vibrant. The broccoli provides that and I love the texture of the roasted broccoli. Of course, you could always mix in cauliflower, romesco, or even roasted Brussels sprouts. When it comes to dressing, I usually keep them really simple: an oil and an acid. However, sometimes I like to boost it a bit with the help from creamy items, like tahini. I’ve also really been enjoying finding more ways to use Nutritional Yeast. The nutritional yeast adds that classic pungent cheese-like punch, helping really make this dressing flavorful. I haven’t always been on the nutritional yeast wagon but as I start to use it more, I’ve gradually fallen in love. The nutty tang has definitely started to play more rolls in my kitchen from the easy, like popcorn, to the slightly more complicated, a stand-in cheese sauce. 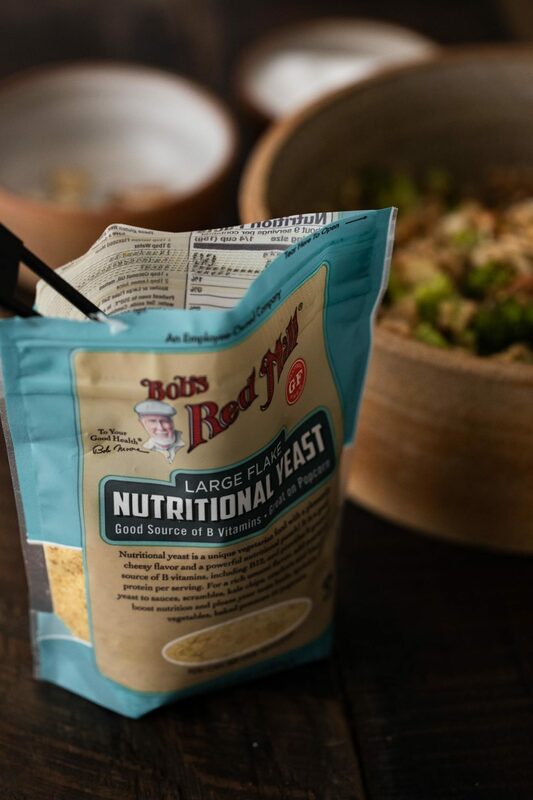 A bag of Bob’s Red Mill Nutritional Yeast is always in the cabinet so we can always have our savory, salty popcorn! 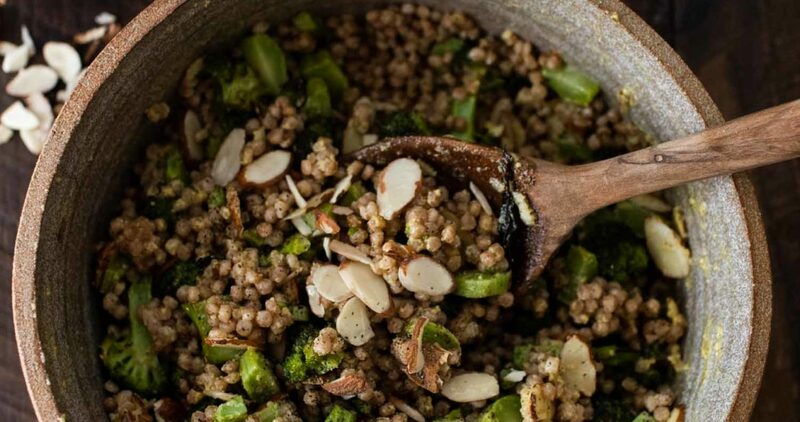 I love using pearl couscous for a quick add into salads and grain bowls. It’s ready in about 10 minutes and it’s the best of both pasta and grains. You could, however, use whole grains in place of the couscous. 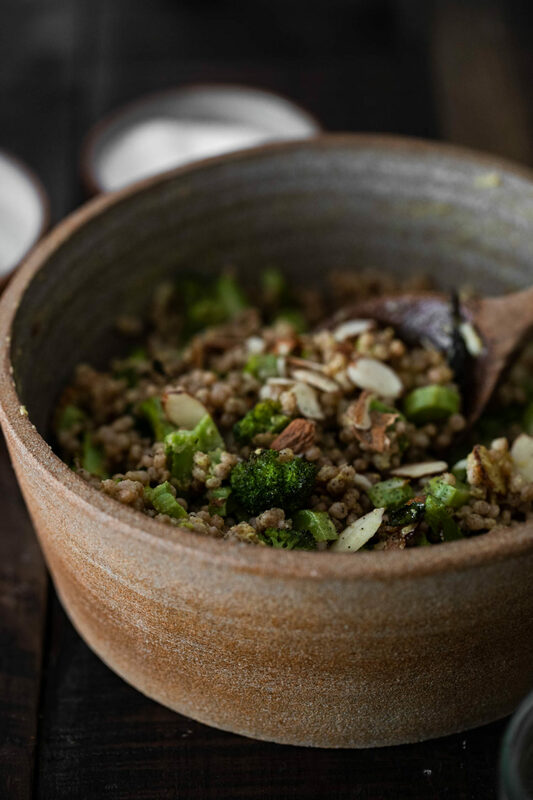 Try using hearty farro, sorghum, or even quinoa. Beyond the nutritional, try adding a bit of crumbled feta. The saltiness is a nice companion for the tahini and nutritional yeast. 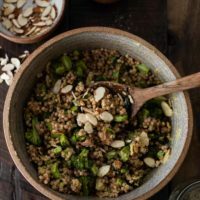 This was really tasty with the tahini and roasted broccoli! Next time I’d double the couscous though as there was barely enough for two people. Loved the addition of the nutritional yeast. It reminded me a little of mac’n cheese! So good and a delicious lunch. Thank you!